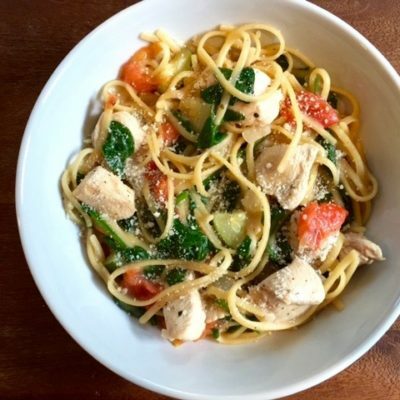 This One Pot Chicken Florentine Pasta is made with the new mom in mind! 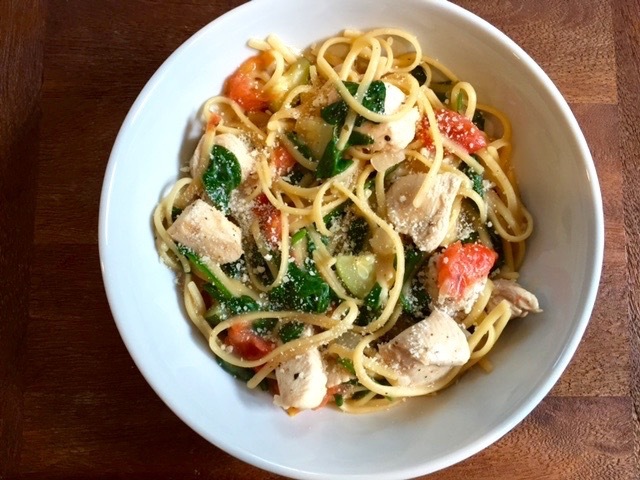 A comforting bowl of chicken, linguine, and veggies that can easily be heated! Bonus: one pot cleanup = sanity. 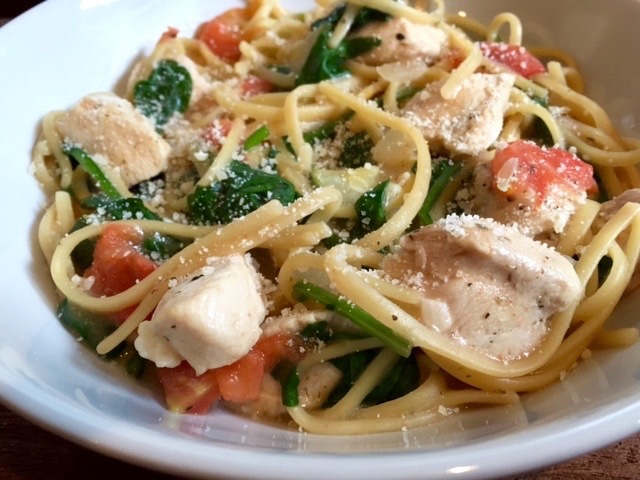 My good blogging friend and fellow RD Katie from Mom To Mom Nutrition is stopping by the blog today to share a delicious recipe she’s cooked up for us, this One Pot Chicken Florentine Pasta is great for a weeknight meal and made with the new mom in mind! I frequently turn to Katie for advice on balancing a nutrition business with raising little boys and all things in between. Thanks a bunch Katie for guest posting today. 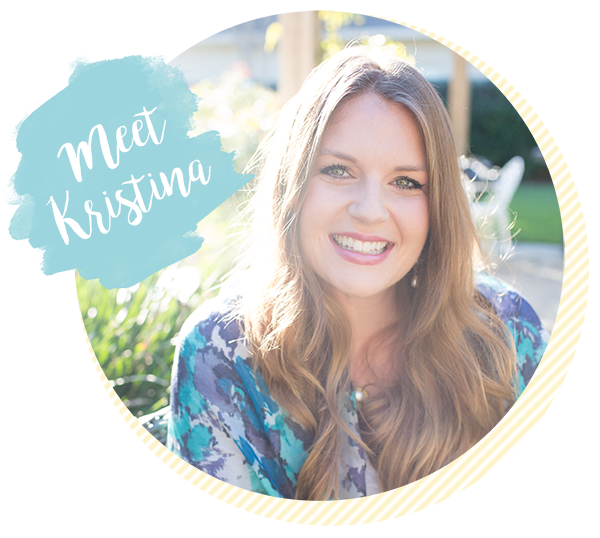 Kristina recently shared with me that this time last year, I was confiding in her my worries and concerns about starting my own business and becoming a Mom of two under two. 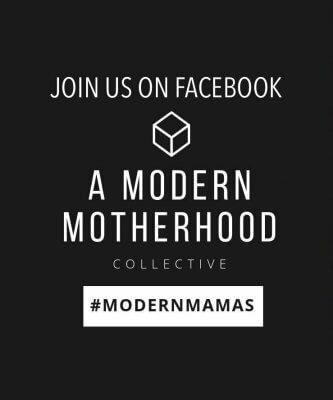 Now Kristina is about to embark on this journey called Motherhood… and as for me? I still haven’t quite figured out my business plans, but I’m becoming seasoned at parenting my boys. 1 for 2 is pretty good, right?! 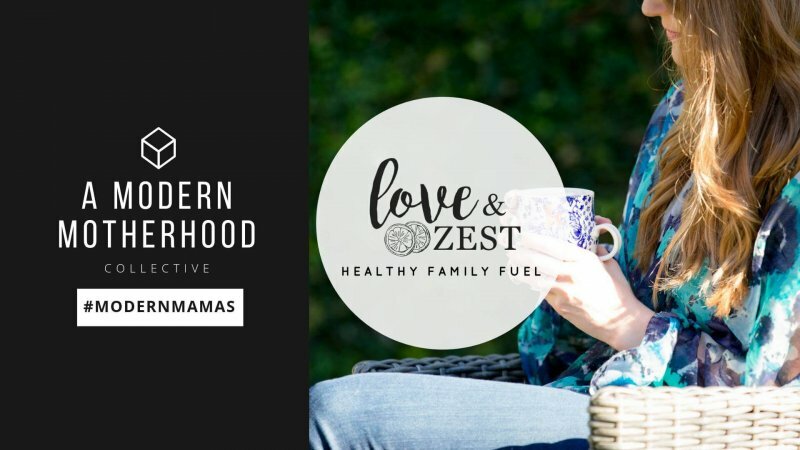 Being both registered dietitians and [soon to be] moms has naturally connected Kristina and I, so I’m thrilled to be able to guest post for her today! Kristina asked me what life is like when you bring a baby into the world. Things clearly change [for the better]. But as I’ve shared with her, breastfeeding is hard, you REALLY need to sleep when the baby sleeps, and it’s always good to accept meals from family and friends. The third was the hardest for me because I’m known as a cook among family and friends. Most people didn’t bring me food because I just wanted company, and I wanted to cook for that company. 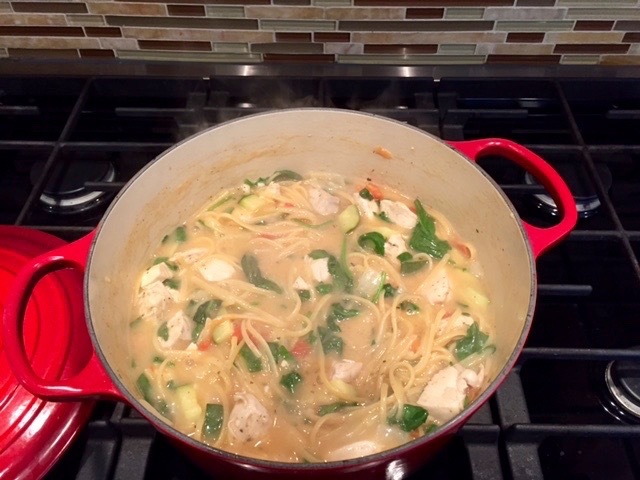 Now regardless if Kristina has the time or energy to cook, I created One Pot Chicken Florentine Pasta with her and baby Parker in mind. Why? Because it’s a one pot meal. So even if you have the energy to cook as a new mom, you won’t want to clean many dishes after the fact! Have you seen the infamous one pot pasta recipe on Pinterest? You know, the one with tomatoes and mushrooms and linguine. Well I have, and admit I was worried about trying my hand at a recipe like that. But it worked! And turned out deliciously. While this recipe is perfect for new and veteran moms because it only uses one dish, I wouldn’t recommend holding a baby while making it. There’s lots of stirring in the 10 minutes it takes to cook the pasta! Heat a large stockpot or Dutch oven over medium high heat. Add olive oil. Season chicken with Italian seasoning, then add to pot. Cook for about 5 minutes, until chicken is browned on all sides. Remove from pot. 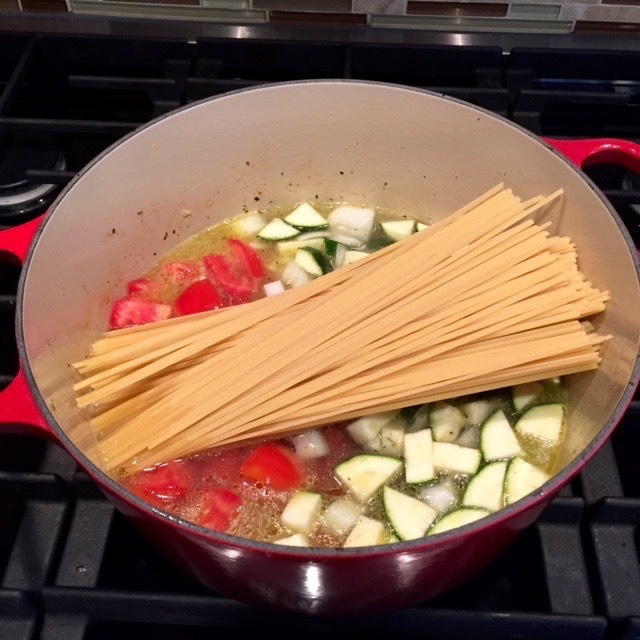 Add tomatoes, onion, zucchini, garlic, water, and pasta to the same pot. Bring to a boil; stir and turn pasta frequently with tongs for about 5 minutes. Return chicken to the pot. Continue turning the pasta for another 5 minutes. Stir in spinach just before serving. Serve with Parmesan cheese. I LOVE all the veggies in this one pot dish! 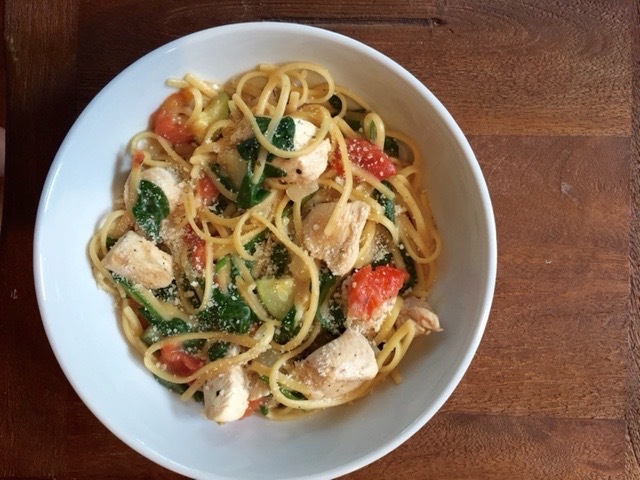 I think I’ll put the spinach in the serving bowl and ladle the Chicken pasta over it. Thanks for the recipe! yum that’s a great idea! I love one pot pasta meals that are easy to prepare throughout the week. Kid friendly too! Thanks for the idea.